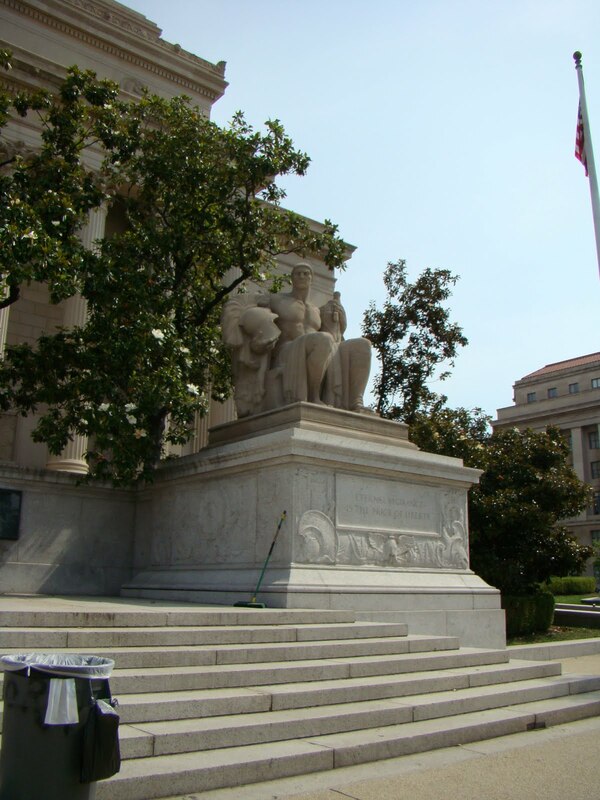 While planning our trip to D.C., I struggled with whether to do research at the National Archives or not. I decided that I was content. However, I had not toured the Rotunda in a long time and that was very cool. The Nation’s Charters of Freedom documents are on display there. Since I could not take pictures inside Wikipedia has a nice one showing what the Rotunda looks like, however, the Rotunda is now darkened so it is not quite as bright as their photo implies. The Charters of Freedom are: The Declaration of Independence, The Constitution and the Bill of Rights. Three of our Nation’s most important documents. 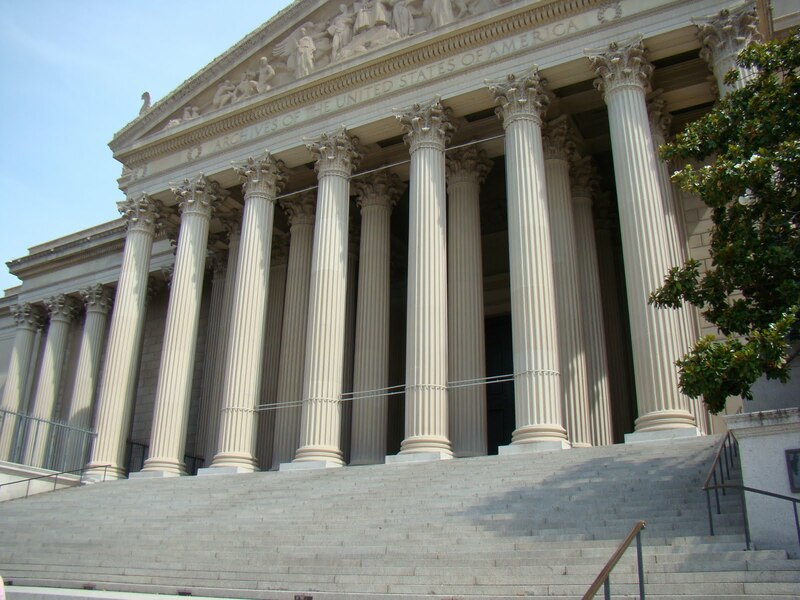 There is so much to do at the National Archives I was surprised. I don’t remember all this from 1999? I think things have changed a lot and restoration has been done for there was evidence that the Rotunda area was quite different than memory serves. You stand in the line to the left and enter into the National Archives in what might be the lower floor. Once through security you can pretty much wander around to different areas and exhibits on your own following the signs. 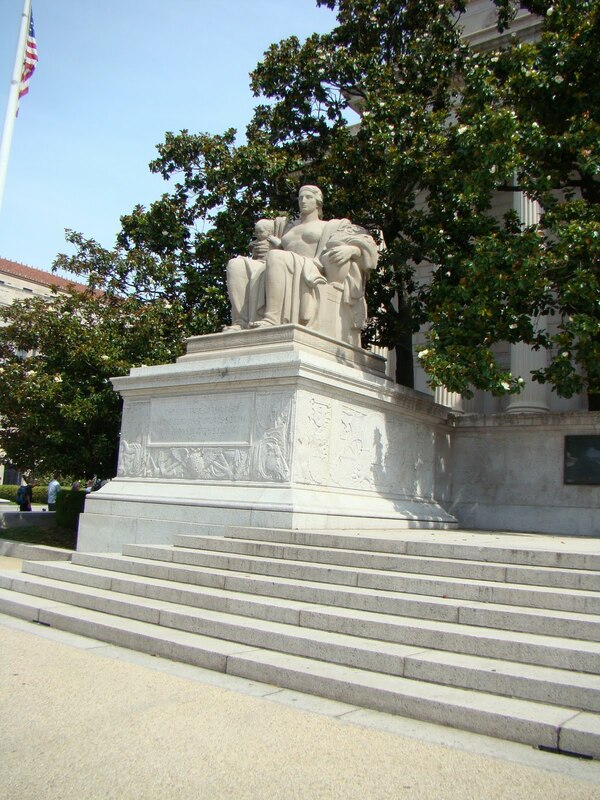 The National Archives building on the outside is very ornate as you see from the photos. To do research you go into the Archives on the North side of the building. I just remember the security checkpoint but there might be more to see there according to a reliable source? There are actually two buildings one in D.C. and the other in College Park. You will have to determine which works for you. When I went years ago I was so green I didn’t know how to use a microfilm reader. I was so intimidated by it all. I suggest that you prepare by visiting the website and studying the rules and regulations. Also do a search of the NARA catalog and pin down as much as possible what you want to research like Civil War pensions or Revolutionary war pensions and more. I know that they have changed things greatly since then and have hours for pulling the documents, so you do need to study up and plan. The other option is to hire someone to help you via the APG (Association of Professional Genealogist). There is a chapter in D.C. called the National Capital Area Chapter of APG. The cost of a Civil War Pension file has gone up greatly and this is an alternative. A professional will be working for you and knows what they are doing and will make sure copies of the whole pension or service file are made for you. Yes, they will charge you but they can get the documents for less, I believe. My friend and colleague Lisa Petersen knows the D.C. area archives very well. She is a member of this chapter check out their membership listing by clicking the link. My great grandfather George A. Barclay’s Civil War pension file was not at NARA! I waited so patiently for it but they said they didn’t have it. AUGGH!!! It was at the Department of Veteran’s Affairs! They, the VA, copied the whole thing and didn’t charge me anything. It was at least 2 inches thick. Yes, I was very fortunate. I obtained other documents as well before they raised the rates. My first stop was the Archives Shop. Now I did see the movie “National Treasure.” The gift store that is in the Archives did not look a bit like the one in the movie…giggle! I studied the gift shop carefully and pondered how I wish I could do more reading. I am amazed at all the books that are written about many topics of history. So little time! Now they have restrooms near the Archives shop and a Cafe? I don’t remember all that from before? I did not go to the Cafe for I was not hungry. I headed to the Rotunda and was immediately stopped with the crowd of people waiting to get in. http://www.magnacharta.org/ It would take a lot of work to prepare for membership. I counted 10 generations for a client to just get to crossing the Atlantic Ocean and that didn’t include England and those generations. As I waited to get into the Rotunda area, I observed the murals on the wall showing our founding fathers looking very much like a Renaissance painting which was a little odd to me???? I tried to count the eagles but could only find six and not the nine they said were in the area. It was very dark and cool in there. At a certain point they let in a group of people, lining you up shoulder to shoulder four lines deep by the gates and steps. I think they wait ten minutes and let you into the Rotunda area as a big group. I headed for the left which was backed up with a line but you can move about if you want. They have display boards with glass and they have prepared materials to lead you to the viewing of the main document. First was the Declaration of Independence and I was amazed that they have copies with corrections on them. The sad part was the Declaration of Independence is so faded. They say it was in light for many years at another location and the ink and parchment do not do well in those conditions. This time the containment area they had it in did not keep dimming and coming back. So it seems they have learned to preserve documents of this type in a different manner. It did make me nervous when the people would lean on the glass but apparently it is okay to do that. There are guards standing there watching. It was difficult to read all that they had prepared and keep the line moving but I noticed that the crowd had diminished. It was about 5:20 pm and they are open till 7 pm for summer. Hmmm…maybe it is in the timing? The next document was the Constitution and the displays led up to how it was created after the Articles of Confederation did not work. They had George Washington’s copy with his corrections. The last was the Bill of Rights and more explanation about its origins. I wish my dad was here to see these documents. He was the true Patriot in my family!